In order to use User Access Levels, you have to specify users for your project. You can create as many users as you need. Each user must have a specified Access Group ranging from 0 to 9 – the higher the number, the higher access rights for the user. TIP: If you wish to use authentication based only on Access Groups, you can leave the Access Level equal to 0. 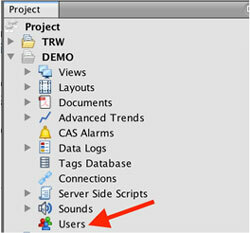 To specify user accounts, select Users from the project tree and double click it. Password. Saved password is encrypted for higher security. 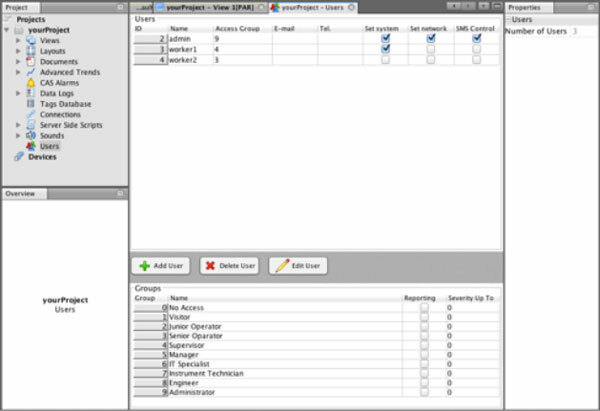 Specify an access group or groups of which a given user is a part. Provide user’s email to receive email notifications. Provide user’s phone number in the international format to receive SMS notifications. myBOX specific settings: enable to control myBOX with SMS commands remotely.